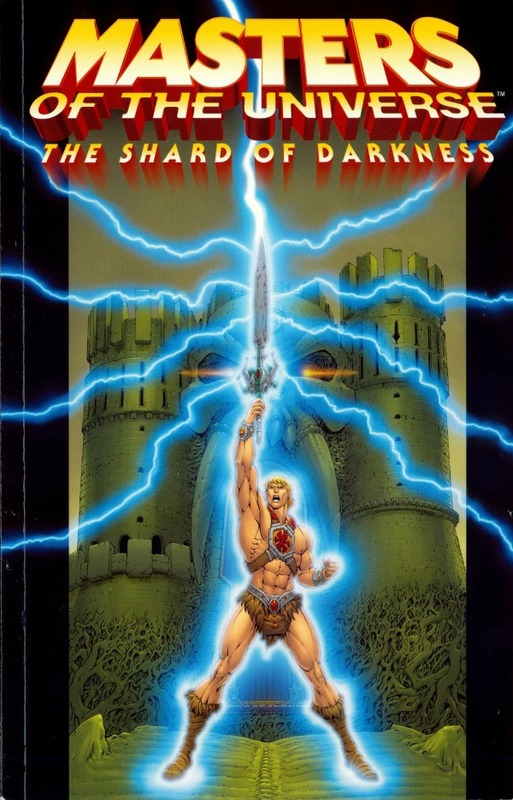 Masters of the Universe: The Shard of Darkness (2003) collects issues #1-4, the full run, of Masters of the Universe volume 1, which was originally published by Image Comics in 2002 and 2003. It was written by Val Staples, penciled by Emiliano Santalucia, and inked by Marco Failla and Pierre-Andre Dery. Here, Evil-Lyn plots against Skeletor and Orko discovers a magic crystal that exerts its influence on whoever holds it. The parallels to Lord of the Rings are obvious, from the evil artifact to its effect on He-Man to the fact that he has to go alone to the appearance of his destination. Even the spirit of the crystal looks mighty like the Balrog from the Peter Jackson film. 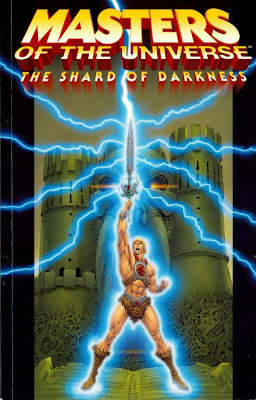 But this isn’t necessarily a flaw, as The Shard of Darkness is an entertaining story with an engaging plot (although it’s never clear why Evil-Lyn didn’t try to retrieve the shard herself in the first place), satisfying action, and a reasonably climactic showdown between He-Man and Skeletor. This story explicitly takes place very early in He-Man’s career, and Staples does a nice job with the character development of He-Man on that front, as he tries to figure out just what it means to have the power of Grayskull. The art is top-notch. The splash pages are all excellent. The characters and backgrounds look good, and the battle between He-Man and the Evil Warriors is impressively intense. There’s also notable attention to detail. The Eternian firefighters are based on the design of the old Snout Spout figure, which is a nice nod to the source material that stops well short of being stupid. A gripe with the TPB itself is that it’s inexplicably undersized: 8.25” by 5.5”. There are also a few typos that seem to have been carried over from the comics. On the whole, though, this is a solid and good-looking He-Man story.